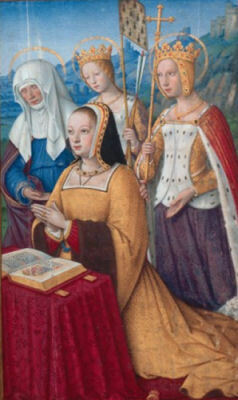 Anne de Bretagne being presented by Saints Anne, Ursula, and Margaret, from the Grandes Heures of Anne of Brittany, now in the Bibliotheque nationale de France in Paris. The shields from the marriage of Anne of Brittany, widow of Charles VIII of France, and Louis XII of France. Anne, Duchess of Brittany (1476/1477 - 1514), was the daughter of Francois II, Duke of Brittany and Margaret of Foix. Francois II was the son of Richard, Count of �tampes, and Marguerite d'Orl�ans. 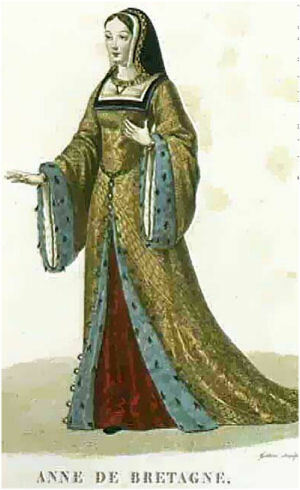 Margaret of Foix was the daughter of Gaston IV, Count of Foix and Eleanor of Navarre. She died in 1486. (Francois II's first wife, Margaret of Brittany, died in 1469. Anne was born in January 25, 1476. A younger sister, Isabeau, was born in 1478 (died 1490). Francois or Francis II had no sons so Anne was Francois' heir. Had she been born a man she would have ruled Brittany as her father did. But she was born a woman in a time when women could not rule. Even though women could not pass on appanages etc. to their sons, Anne of Brittany could inherit Brittany because Brittany was a fief rather than an appanage. The French were eager to use the opportunity afforded by the lack of male heirs to absorb Brittany. Anne was educated by Fran�oise de Dinan, Lady of Laval and Chateaubriant, and the poet Jean Meschinot. In 1483 her hand was sought in marriage for Edward, Prince of Wales, son of Edward IV of England. But the young Edward soon went missing and was presumed dead after his father, Edward IV, died. Other suitors included Maximilian of Austria (whose wife had died in 1482), Alain d'Albret, Jean de Ch�lons (Prince of Orange), and even Louis, Duke of Orl�ans (who already had a wife). Francois II's forces were defeated by the forces of Charles VIII of France at the Battle of Saint-Aubin-du-Cormier in July 1488. Before he died in September 1488, he was forced to sign the treaty of Verger which allowed the French king to have control over who Anne of Brittany married. Anne was only 11 when she became the Duchess of Brittany but she tried to maintain Brittany's independence. In 1490 she married Maximilian of Austria by proxy in the hopes that Austria would defend Brittany. Emperor Maximilian (1459 - 1519) was the son of Emperor Frederick III and Eleanor of Portugal. He had married his first wife, Marie of Burgundy (1457 - 1482), in 1477. 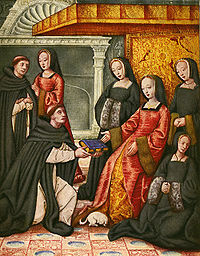 Marie of Burgundy was the mother of Philip the Handsome and Margaret. Marie of Burgundy died in 1482 and Maximilian was now looking for a second wife. He was considered handsome and charming in his day. He was a hunter, a patron of the arts, a blacksmith, an animal-lover, a warrior, and a courteous knight. He was also extravagant, extremely self-confident, and proud of his family. His finances did not always equal his plans. The French king, Charles VIII, was at that time engaged to marry Margaret of Austria, the daughter of Maximilian of Austria (and Mary of Burgundy 1457 - 1482). Margaret of Austria had been raised in the French court since the age of three. But after Anne of Brittany's forces were defeated by the French she was forced to marry the French king, Charles VIII, late in 1491. This angered Maximilian of Austria, who thus lost Anne of Brittany as a bride and lost Charles VIII as a husband for his daughter, Margaret of Austria, but Maximilian did not choose to fight France over the issue. Margaret of Austria went on to marry Juan of Castile (1478 - 1497), the son of Ferdinand II of Aragon and Isabella I of Castile. After Juan's death she married Philibert of Savoy (1480 - 1504). Margaret's brother was Philip the Handsome (1478 - 1506), who was the husband of Joanna of Castile (1479 - 1555). Maximilian went on to marry Bianca Maria, the daughter of Galeazzo Maria Sforza, Duke of Milan, in 1494. By then Maximilian had become emperor (1493). Bianca Maria died in 1512. Charles VIII's father had added many territories to France. In 1491, Charles VIII added Brittany to France when he married Anne, Duchess of Brittany. They married late in 1491. Anne would have been about 15 at the time. Charles VIII fell deeply in love with Anne of Brittany and Anne of Brittany was said to have fallen in love with Charles VIII. Charles VIII was the young son of Louis XI and Charlotte of Savoy. His father, Louis XI (1423- 1483, ruled 1461 - 1483), was almost disinherited by his own father, Charles VII. Charles VII (1403 - 1461, ruled 1422 - 1461) was the brother of Catherine of Valois, the wife of Henry V of England. When Louis XI's father, Charles VII, died, Louis XI refused to mourn. Instead he wore a red and white hat (the national colors of France) and went hunting. Louis XI strengthened the monarchy and extended the prohibition against the French throne being passed on through the female line to still other situations. The daughters of French kings had been banned from passing on the throne to keep Edward III of England from inheriting the French throne through his mother, Isabelle of France. Louis XI extended this rule to banning women from passing on appanges (territories given by a king to his younger sons). Louis XI used this rule to add the duchy of Burgundy to France after Charles the Bold died in 1477 with "only" a daughter for an heir. Louis XI also added or restored Picardy, Artois, Provence (and Marseilles), Maine, Anjou, and Normandy to France. He also developed France's silk industry at Lyons. Louis XI also kept England's Edward IV from renewing the Hundred Years War with France. Once the threat of England was over, and once France had Provence, France began to turn its eyes towards Italy. Charles VIII, the husband of Anne of Brittany, would continue that trend. Charles VIII was only 13 when his father died in 1483. Charles VIII had a large head and was very thin. He was not seen as very intelligent but he was seen as affable, genial, and sweet. Since he was so young, his older sister, Anne of France, served as an unofficial regent. Mothers of kings could be regents but sisters of kings could not. Anne of France (1461 - 1522) was the daughter of Louis XI and his second wife, Charlotte of Savoy. Anne of France married Pierre of Bourbon, lord of Beaujeu, in 1474. Her husband was a counselor of her father, Louis XI, and was a younger brother of Jean II, duke of Bourbon. Pierre of Bourbon (1456 - 1503) was also appointed as governor over Charles VIII. As regent, Anne of France worked to strengthen the monarchy and curb the power of nobles, such as the future Louis XII. Nevertheless, she worked hard to hold on to her Bourbon lands. Charles VIII had many issues to deal with, such as the rigid class society of France. In England, the nobles were not allowed to own large, contiguous plots of land. Instead their holdings were scattered amongst the counties so they could not challenge the king. 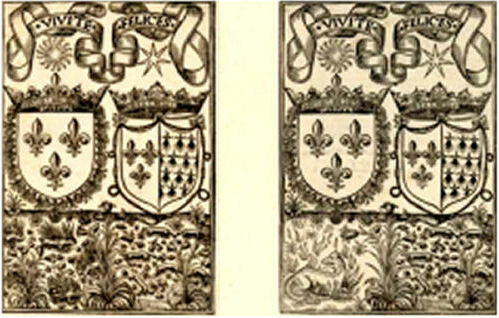 The French nobles, the Second Estate, held their lands from the king and only owed him 40 days of military service. They were mostly concerned with tournaments and courtly love. The serfs and peasants were beneath the lords. The First Estate was the Church. The Third Estate were the wealthy merchants of places such as Paris. These three estates wanted to meet at the Estates-General in 1484. The meeting was supposed to be held every two years but it rarely met. In 1488, Anne of France's husband became duke of Bourbon and Anne became the duchess. She began to turn more of her attention towards her husband's lands. Anne of France and Pierre, duke of Bourbon had a daughter, Suzanne of Bourbon (1491 - 1521). Pierre II, duke of Bourbon died in 1503. Anne, duchess of Bourbon, had a book of hours illustrated by her mother's favorite illuminator, Jean Colombe, made around 1474. Anne also expanded the ducal castle at Moulins in 1490 and the castle of Chantelle, near Saint-Pourcain, in 1500. She also patronized Jean Hey, the painter employed by Pierre's older brother, Cardinal Charles of Bourbon, archbishop of Lyon. The Bourbon patrons were Saint Peter, Saint Anne, and Saint Suzanne. Charles VIII sought a release from his problems by directing the energies of France southward across the Alps. In 1494 the French were at the gates of Rome. Charles VIII became enchanted with Italian art. The influence of the Italian Renaissance on French culture became one of the turning points that brought France from the medieval world to the modern world. Tapestries, especially with scenes of hunts, were very popular at this time. The "Chasse au Faucon" set of tapestries, which are now in the Mus�e Cluny, dates from the time of Charles VIII. Jehan Bourdichon (1478 - 1516) was the Court painter of Charles VIII and Anne of Brittany around 1495. He was also the valet de chambre to Charles VIII. Bourdichon belonged to the Franco-Flemish school of artists. Charles VIII is also known to have had a set of tapestries called the Story of the Trojan War. This was an 11 piece set produced by Pasquier Grenier in the 1460s. Grenier was the finest tapestry merchant of Tournai. Sets of the Trojan War tapestries were also owned by Henry VII of England and Charles the Bold of Burgundy. The sixth tapestry contains an extant scene of the Sagittary (the centaurs) fighting the Greeks. Charles VIII often wore a style of clothes that was fashionable from 1480 - 1510 and which was influenced by the Italians. The Italians set the standards for fashion at that time. In one portrait he wore a gold brocade robe lined and turned back with sable. It has wide sleeves. Fabric at the neck was turned back to form right angles. 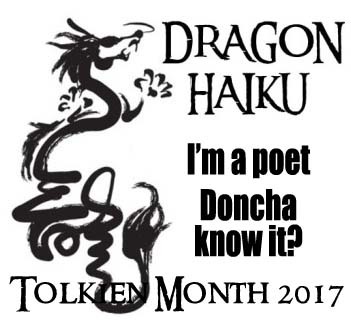 He wore a heavy gold pendant and chain over his shoulders. He also wore a black velvet bonet with a circular brooch that was decorated with jewels and pearls. A painting of Charles VIII by Andrea Solari is now in the Louvre. Anne and Charles had two sons. Charles Orland (1492 - 1495) lived to be three. Jean Hey painted a portrait of Charles Orland in 1494. Charles Orland died during a measles epidemic in Amboise. They also had a younger son, who was also named Charles. Both died young. Charles VIII died in 1498 at the age of 28. He is said to have hit his head on a low lintel of a door at the chateau of Amboise on the Loire. Anne was said to have been greatly affected by the death of her husband, Charles VIII. Before her time, French queens wore white to show their sorrow when their loves ones died. Anne began the fashion of wearing black for mourning after Charles VIII died. Anne quickly returned to Nantes, the capital of Brittany. 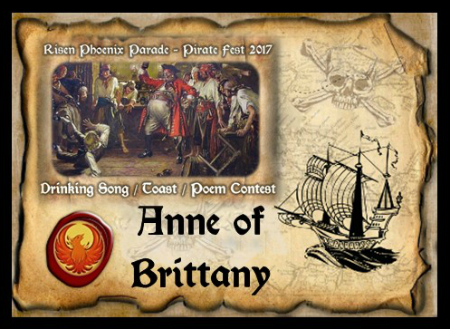 There she minted coins and asserted her control over Brittany. She moved ceremonial items from her first childbed and other objects from Amboise to her castle at Nantes or to storage in Tours. These objects included tapestries and other luxury goods. 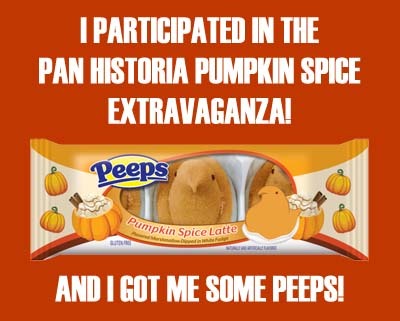 (She returned these items to the French royal residences at a much slower rate in 1499). She also negotiated a marriage with Louis XII, the successor of Charles VIII. In 1498 or early 1499 she married the new French king, Louis XII. Louis XII divorced his first wife, Jeanne of France (1462/1464 - 1505), the sister of Charles VIII and Anne of France and the daughter of Louis XI, in order to marry Anne of Brittany and keep Brittany as part of France. Anne was able to negotiate better terms for her second marriage (or third if you count the marriage to Maximilian), including more control over Brittany and use of Brittany's revenue. She also negotiated the right of her second son (or her daughter) to inherit the duchy and keep it independent from France. 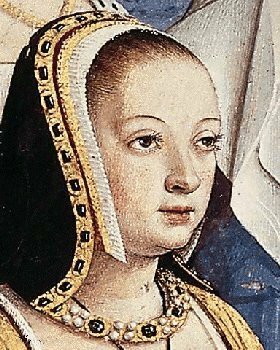 Anne of Brittany is said to have worn white on her wedding day in 1499. This may have been the first recorded white wedding dress. Louis XII was part of the Orl�ans branch of the House of Valois. He was the grandson of Louis I of Orl�ans (1372 - 1407). Louis I of Orl�ans was the younger brother of King Charles VI of France (1368 - 1422). Charles VI was the great-grandfather of Charles VIII. Louis XII's parents were Charles of Orl�ans (1391 - 1465), Duc d'Orl�ans, and Marie of Cleves (died 1487). His badge was the crowned porcupine. When he became king of France his titles included King of Jerusalem, King of the Two Sicilies, and Duke of Milan. He was said to be religious, sweet-natured, and interested in learning. He also put more importance on being economical than extravagant. Soon after Anne married Louis XII and gave birth to her daughter, Claude (born 1499), Anne began building a wonderful marble tomb for her parents at the church of the Carmelites in Nantes (now Nantes Cathedral). She also built a tomb for her sons by Charles VIII in Saint-Martin's in Tours (now the church of Saint-Gatien). Anne was not crowned queen of France for the second time until 1504. By that time she had been married to Louis XII for almost five years and had given birth to Claude (1499). (Renee was not born until 1510). Anne was crowned at Saint-Denis. Her wedding ring was blessed by Cardinal Georges d'Amboise. Some suggest that the coronation was held because Louis XII was recovering from a serious illness and that Anne wanted to be able to reign in his stead if she needed. Louis XII also became involved in Italy. Pope Julius II, the builder of St. Peter's and the Sistine Chapel, wanted the French as allies against the Venetians. Louis XII was successful in battle and soon occupied Milan. Julius II felt the French had become too powerful and he quickly switched sides. In 1513, Louis' army was defeated at Novara. Milan fell and the French retreated across the Alps. Anne of Brittany was seen as shrewd and clever but narrow-minded, ostentatious but with unrefined tastes, and plain-featured and homely. One of her legs was shorter than the other so she walked with a limp. Court ladies imitated her limping walk. She had a large number of ladies and young girls in her court. They included Maids of Honour, Ladies-in-Waiting, Gentlewomen of the Bedchamber, and Tirewomen. She discouraged her ladies from attending public festivities but allowed them to appear at court ceremonies. She also had a Lord Chamberlain, Steward, Secretary, and Keeper of the Privy Purse. She had a personal bodyguard of 100 men, most of them Bretons, who accompanied her to Mass or on her promenades. They also went with her to a terrace at Blois that is still called the Bretons' Perch. Anne of Brittany wore what became known in England as the French hood. It was a semicircular hood made from black velvet that was lined with white or colored silk. The front edge was lined with jewels in gold mountings. There was a black tube in the back. It was worn over a cap edged with pearls. Under the cap was a goffering of double gold gauze. A painting of this hood dates to 1507. Anne also had many pendants, which were two plates joined together so that there was space in the middle for a relic. One pendant that Anne owned dates to 1500 and is now in the Louvre. It is 4 inches long and has an enameled background with six large jewels that run along the circular edge. There are groups of small pearls between each jewel. The center has a figure of John the Baptist with a basket of eggs or locusts. There is a gold nimbus (halo) on his head. There is also a tiny golden lamb in the upper right corner of the pendant. The lamb also has a nimbus. On the top left corner of the pendant there is a tiny gold building with spires. Anne was a patron of illuminated manuscripts. Jean Bourdichon illustrated her Grandes Heures. Anne also supported the creation of a tiny book called Very Small Hours. A prayer book illuminated by Jean Poyer was intended to teach her son to pray. She also had a Florentine prayer book with a petition of Saint Leonard to help the queen during childbirth. Anne of Brittany died January 21st, 1514 (or, less accurately, 1515). Her youngest daughter, Renee, would have been no more than 4. Claude would have been about 15. Anne was buried on February 12th in the Church of St. Denis. Her tomb has kneeling effigies of Louis XII and herself. Just as Anne had worn black at the death of her husband, Charles VIII, her second husband, Louis XII, wore black for her death. And like her, he quickly remarried. Louis' third wife was Mary Tudor, the younger sister of Henry VIII of England. They married in 1515, when Louis was 53 and Mary Tudor was 16. Before his third marriage he typically went to bed at 6 but after he remarried he stayed up until midnight. He is said to have overexerted himself with his young bride and he died after three months of marriage. Anne of Brittany and Louis XII had two daughters who survived to adulthood. Claude of France (1499 - October 26, 1524) went on to become the Queen of France and marry Francis, Duc de Valois, later Francis I (1494 - 1547, ruled 1515 - 1547), the successor of Louis XII. They married May 10, 1514. Francis I's parents were Charles of Angoul�me (1459 - 1496) and the formidible Louise of Savoy (1476 - 1531). Francis I was the grandson of John of Angoul�me. John of Angoul�me was the younger brother of Charles of Orl�ans. Charles of Orl�ans (1391 - 1465) and Marie of Cleves were the parents of Louis XII. Claude and Francis I's children were Francis, the Dauphin (1517 - 1536), Henry, Duc d'Orl�ans, later Dauphin and Henry II (born 1518), Charles, Duc d'Orl�ans (1521 - 1545), Charlotte (born 1516, died young), Magdalene (1520 - 1537), and Marguerite (1523 - 1574). Magdalene, the eldest surviving daughter, married James V of Scotland in January 1537 and died July 1537. Marguerite married Edmund Philibert, Duke of Savoy, in 1559. Claude was seen as meek and pious and she put up with her husband's many infidelities. She worked hard to create a welcoming court for visitors and instructed her ladies to help entertain the guests. Claude's ladies took part in the court festivities but in a restrained, austere way. Francis I's mother, Louise of Savoy, encouraged her son to allow the ladies-in-waiting to take part in all amusements and pageantries. The court ladies soon threw off the previous restraints and soon "overstepped the limits of decorum". Claude's sister was Renee of France (1510 - June 15, 1574), who should have inherited the Duchy of Brittany. Instead she was married off to Hercule d'Este, Duc de Ferrara on June 28, 1528. Her court in Ferrara welcomed many stars of the Italian Renaissance and she protected members of the reformed religion. Her husband died in October 1558. At that time she was given the choice of receiving her own land and living in Ferrara if she lived as a good Catholic or of returning to France. Her son, duc Alphonse II, felt it was better that she return to France so she did. She had renounced her rights to Brittany so she was given the house of Montargis, which she moved to in 1560. Her home in Montargis soon attracted great thinkers and Protestants. She continued to appear at court and was at the wedding of Henri de Navarre. She was at court on the day of the Saint Bartholemew's massacre but she left Paris before there was any danger. Montargis became a refuge for fleeing Huguenots. Renee died at Montargis in 1574. Renee had a son, duc Alphonse II, and a daughter, Anne. Kings, Queens, and Courtiers: Art in Early Renaissance France, Martha Wolff (ed), New Haven: Yale University Press/The Art Institute of Chicago, 2011. La Belle France: A Short History, Alistair Horne, New York: Vintage Books/Random House, 2004. Tudor Costume and Fashion, by Herbert Norris, Mineola, New York: Dover Publications, 1997.